The EuroCup final is upon us and we have an all-Spanish affair to look forward to. This is a best of 3 series so we are guaranteed at least two games but this could be a clash that goes right to the wire. These two sides know all about each other in domestic basketball but this European clash is going to be a very different affair. The glory of winning the EuroCup is all that the players need to drive themselves on in this series but there is also the added bonus in that the winning team books their place in the Euroleague for next season! 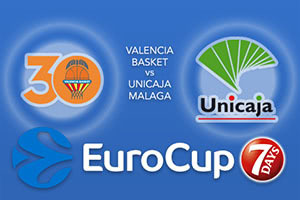 The hosts are the side with the best pedigree in the EuroCup and this series represents their fifth EuroCup final. That is a record and they have a very good record so far, winning three of the four finals they have contested. If they clinch a win against Malaga, they will take their fourth title, which will be twice as many as their nearest challenger so it is fair to say that when it comes to the Euroleague, Valencia have a fantastic record. There is also an incentive or two for Rafa Martinez, the Valencia captain. Martinez is already the most highly ranked player with respect to three-point efforts in the EuroCup but if he plays two games in this series, he will be the player that has played most games in the tournament. Martinez currently sits on 129 games while Vladimir Veremeenko has played 130 games, so Tuesday night could see Martinez equal the record. Martinez is also in the running to be the all-time top scorer in the EuroCup, with 1,185 points so far but then again, team-mate Bojan Dubljevic is not too far behind with 1,176 points. Marko Popovic is the current leader with 1,188 points. Last but certainly not least, a triumph would see Martinez be the first player to have lifted three EuroCup titles. Joan Plaza, the coach of Malaga, knows a thing or two about the EuroCup and this will be his third final, having previously reached this stage with Real Madrid and Cajasol Sevilla. Both sides have great defensive records, Valencia have given up 73.9 points per game and Malaga have allowed 74.2 points per game, so we should expect a tense affair in this series. The hosts will be desperate to make the most of the advantage they have received in the opening take and you can back Valencia Basket at -7.5 which is provided at odds of 1.90. If you’re looking for the Over/Under market in the opening game of the EuroCup final, go UNDER 152.5 which is provided at odds of 1.90. Bet Now!